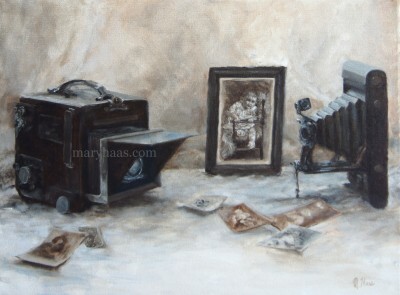 For this still life I selected only black, white, and sepia objects in order to do a value and temperature study. The painting was done using a limited palette of cobalt blue, transparent red oxide, and white. The cameras and photographs are family heirlooms-the baby in the framed photograph was the original owner of both cameras. Prints of this painting are available for sale here. The original is 18×24, acrylic on canvas.